Italianate style, deep eaves, brackets. 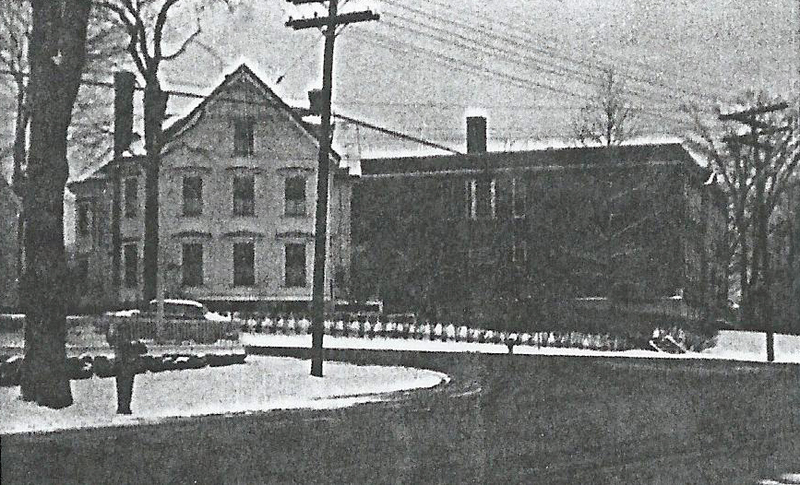 The site of the 1961 addition to the St. Augustine School was formerly the location of the Henry G. Tyer homestead which faced on Chestnut Street. Henry G. Tyer founded the Tyer Rubber Co. in Andover in 1856, developed and patented the compo shoe design and white rubber process used for pharmaceutical purposes. The first factory was in Ballardvale under the name of North American Patent Shoe Co. in 1856. He partnered briefly with George B. Boice of NJ under the name of Tyer, Boice & Co. and moved the factory to a former Andover & Wilmington Railroad building on No. 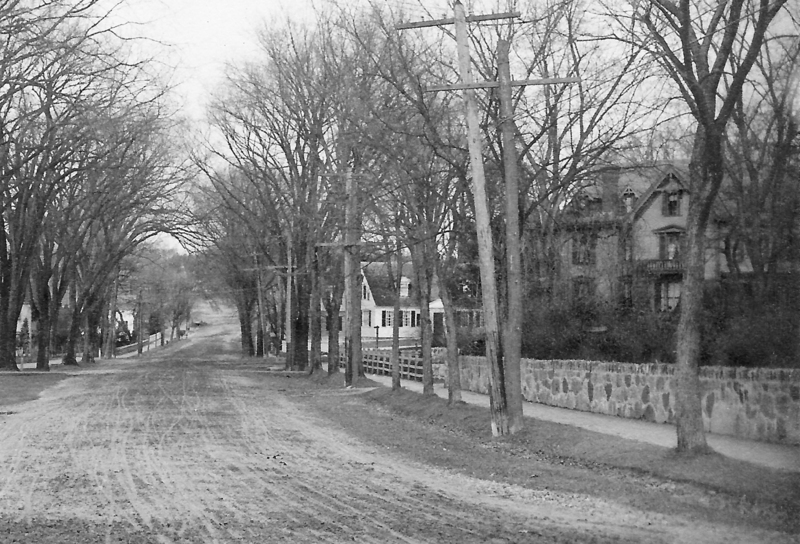 Main St. now the site of the present Andover Public Safety Building. The factory was in operation there until the early 1960's. A larger plant was later constructed on Railroad St in 1912. Henry Tyer built the house on Chestnut St. about 1866 after the purchase of the property in Oct. 1865. In the 1860 census Tyer and family live on No. Main St. near his factory and were probably renting. 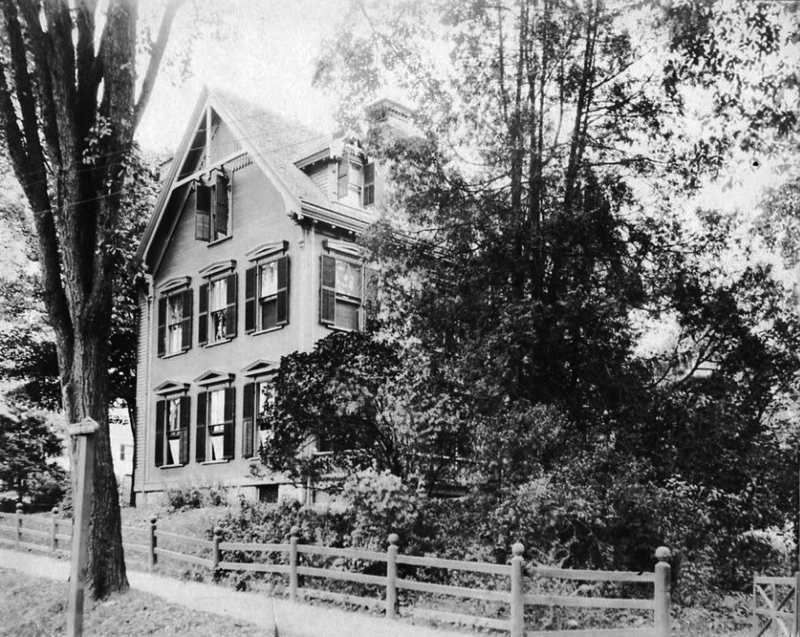 This home would later become his son Horace H. Tyer's residence, who took over as president of the company after his father's death. Henry died on July 10, 1882. The 1870 Valuation was 1 acre of land $1600, house $3400, and barn $200. A few months after his father's death Horace began extensive alterations to the house. October 12, 1882 Andover Advertiser - "H. H. Tyer is raising his residence on Chestnut St. 2 ½ feet and will put on a new roof. The inside of the house will also be thoroughly remodeled. Charles T. Emerson, architect of Lawrence is the contractor for the job and expects to complete it by the first of January." This corner lot had extensive gardens extending down Central Street and included a barn attached to the rear of the house. Henry George Tyer was born on Feb. 23, 1812 in Hackney, England. He was the son of Henry G. and Elizabeth S. (Musgrove) Tyer. Henry married Elizabeth Birch on Sept. 25, 1834 at the Parish of St. Mary Lambeth in Surrey. Elizabeth was the daughter of John & Rebekah Musgrove. Our Musgrove building in Elm Sq. takes its name from this family connection. Henry & Elizabeth had eight children, three born in England; Elizabeth b. 1835, Mary b. 1838 & Henry b. 1840 - d. 1841. The family emigrated to the United States and first settled in New Brunswick, New Jersey where Tyer began his work in rubber production. Here the remaining five children were born, Catherine b. 1842, Horace Henry b. 1844, Frances Anna b. 1847, George Austin b. 1849 and Laura Birch b. 1852. Of the children, Elizabeth, Catherine and George never married. Elizabeth d. in 1912, Catherine d. Nov. 7, 1885, and George died July 4, 1877 at age 27 of Typhoid fever in San Francisco, while working for his father's company. Mary married John M. Fiske and lived in Natick. Frances Anna married John H. Flint of Andover, who became Treasurer of Tyer Rubber Co., lived at 8 Elm Square and built the Musgrove Building. Laura Birch Tyer married Frederick W. Thomas. Son Horace Henry Tyer married Catherine Susan Buss on Sept. 12, 1878 in Medford, MA. Catherine b. Sept. 12, 1854 married on her 24th birthday. She was born in Boston daughter of Samuel L. & Margaret B. Buss. They had four children; Edith Margaret b. 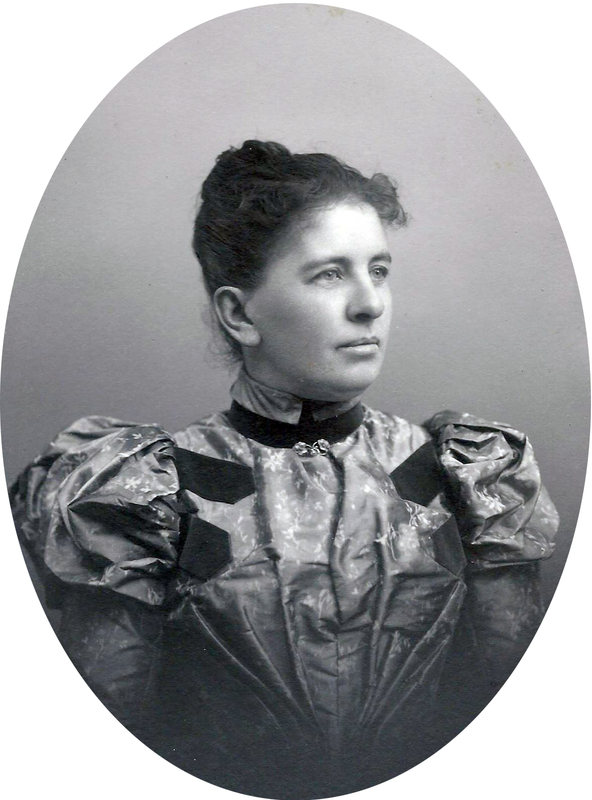 1879, Carrie Elizabeth b. May 20, 1883 d. July 15, 1885 of Diphtheria & Whooping Cough, Henry George II b. Feb. 5, 1885 and Frances Louise b. Aug. 29, 1886. 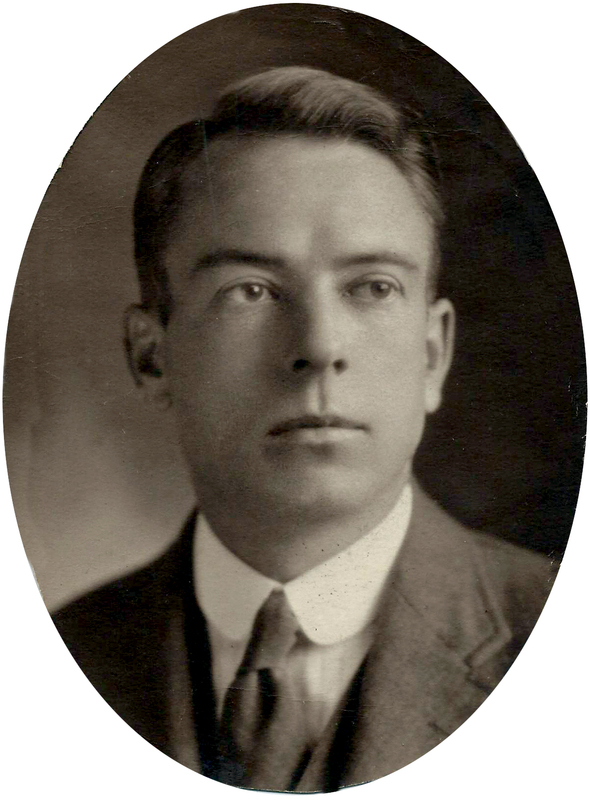 Their son Henry G. Tyer would continue the family connection with his grandfather's company as vice-president until his death in 1947. He married Winifred Hopkins Le Boutillier b. 1900 daughter of Addison Le. Boutillier, architect & designer of Punchard High School and Shawsheen School. 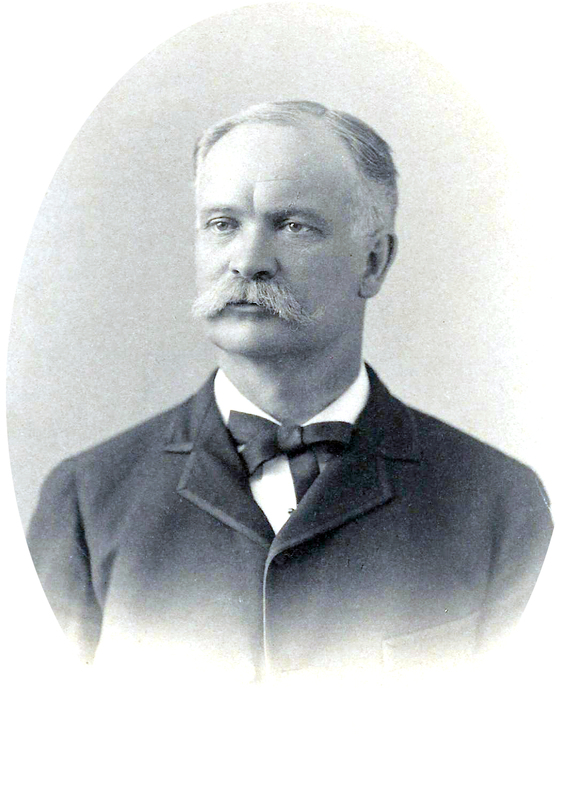 Horace H. Tyer died in 1907. His widow Catherine and daughter Edith continued to live in the house. 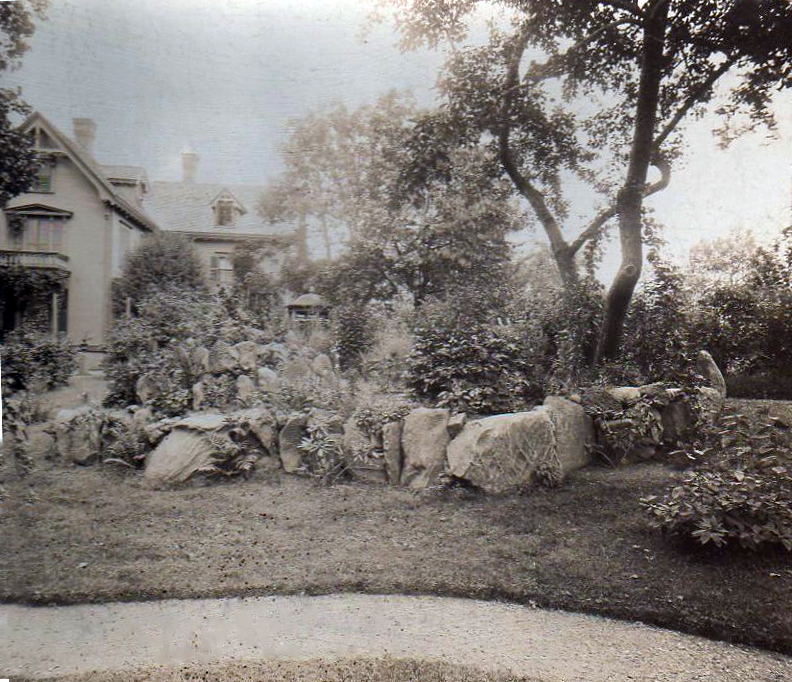 On July 30, 1913 Catherine sold the property to Thomas M. Smith of Boston. She was unaware that the property was to be used as a Parochial school site and attempted to purchased it back but the sale was complete. Thomas Smith transferred the property to the St. Mary's Church Society of Lawrence, James J. O'Rielly president. The site would become the first Roman Catholic School in Andover. In 1907 St. Augustine's Parish welcomed the Very Reverend Frederick S. Riordan to the church and it was through his efforts the school was establish. "Not waiting for the school to be erected, the Sisters fitted up the lower floor of their convent into classrooms, and began teaching in 1914 on September 8." 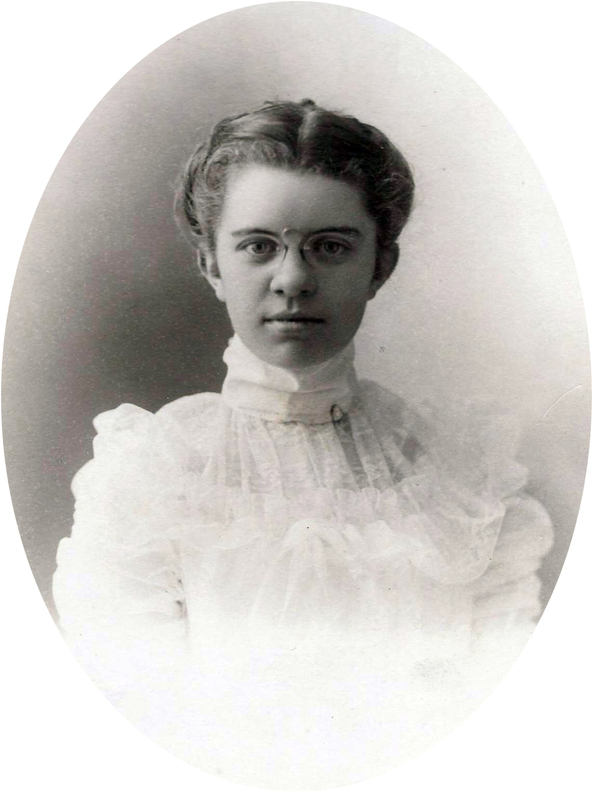 Sister Helen Bernadine was the first principal serving twice from 1914-1921 and 1927-1931. The former Tyer house served as a convent for the teaching Nuns of the Order of Notre Dame until 1961 and the lower floor for St. Augustine's first school rooms until the new school was constructed in 1914. The Tyer mansion was razed to build a new addition to the school building. Mar. 23, 1961 Andover Townsman p3 – Photo - St. Augustine’s demolish house just behind school which was used as a convent. Sept. 21, 1917 - Corner stone of St. Augustine’s School laid – Long article and drawing of the school on back page. 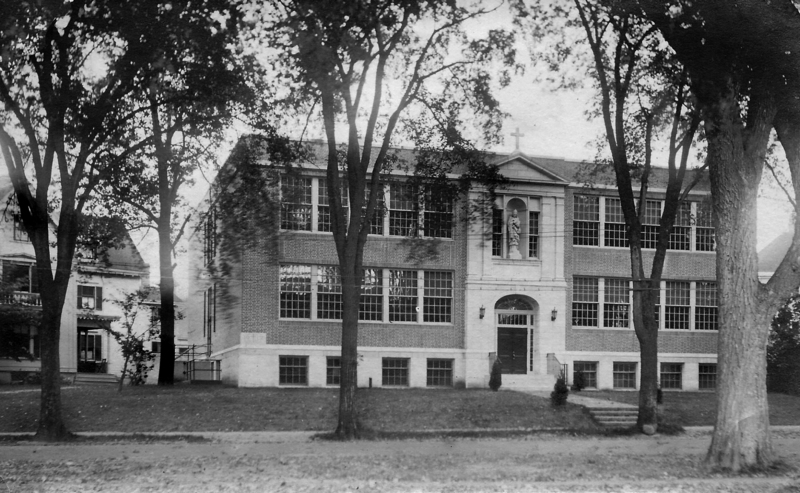 The new schoolhouse was formerly opened on September 8, 1918. Fr. Riordan had left several months earlier to become head of a Lawrence parish. Elizabeth Tyer estate, heirs, Elizabeth, Mary, Frances A., Catherine L., Laura B. and Horace H. Tyer, children of Henry & Elizabeth Tyer. Heirs, Elizabeth & John W. Savery, Mary T. & John W. Fiske, Frances & John H. Flint, Catherine L. Tyer, and Laura & Frederick W. Thomas. - quit claim to sister. 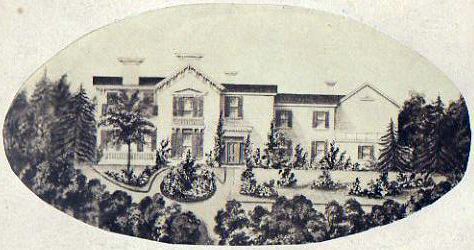 Drawing of the Henry Tyer Estate, view from Central St.
Tyer house on left as the Convent.